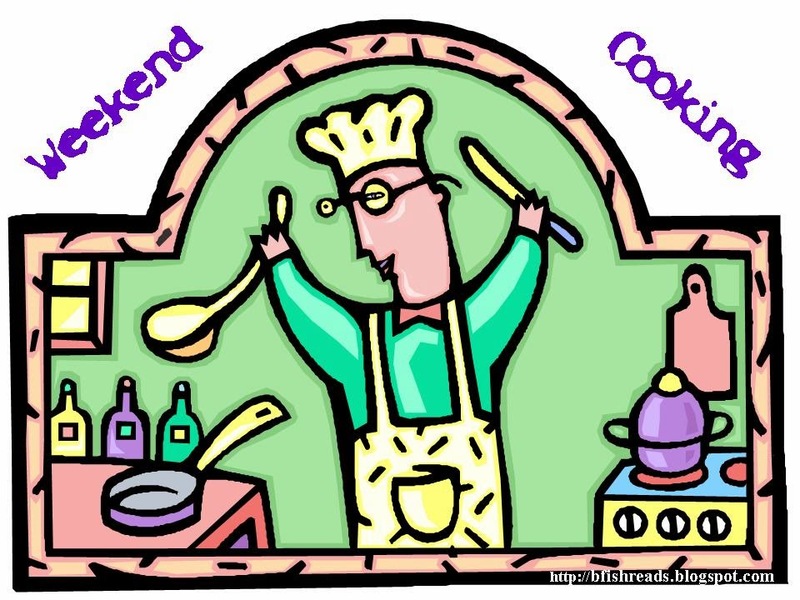 Welcome to Weekend Cooking, hosted by Beth Fish Reads! I'm sharing the recipes that I'll be whipping up tomorrow for Dewey's 24 Hour Readathon. These recipes, and more, can be found on my Pinterest boards if you are so inclined to check them out. I'll be sharing photos of my reading & cooking adventures on Instagram as well. I'll be putting the Sleepin' In Omlette together tonight so it's ready to pop in the oven tomorrow morning. I haven't made this before so my fingers are firmly crossed that it's as tasty as it looks and sounds. 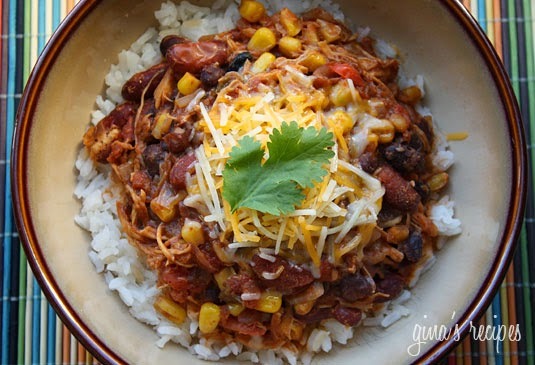 This Crock Pot Chicken Taco Chili is absolutely yummy. I've made it numerous times and everyone in my family gobbles it up. I usually serve it over brown rice. If I'm feeling particularly naughty I'll crush up some tortilla chips over the top. I'll get this right in the crock pot as soon as I wake up so I'll be able to nosh on it at lunch and for the rest of the day. 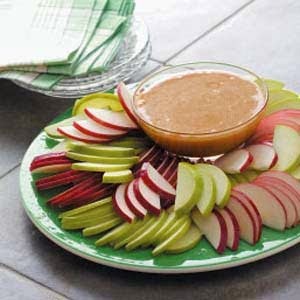 I have to get my fruit in for the day and I've found that making Quick Caramel Apple Dip is the best way to do so. I made this for the last readathon and I was greatly impressed. It's easy to make AND delicious to eat, you can't beat that. Lastly, and most importantly, I'll never be far away from a cup of coffee. Yes, I am trying to be healthy, but I'm not a masochist. Are you participating in Dewey's 24 Hour Readathon? If so, what will you be eating and drinking? Sounds like you've got it all planned!! Happy reading! Now I'm just hoping that it all comes together and that nothing burns, lol. I looooove that chicken taco chili! It's perfect for any time of year, and it's so, so yummy. Great choice! I made chicken tacos in the corkpot last readathon! Nom NOM, so good. Having that S.O. run to get things is important too, lol. You never know when you might run out of cheese or something, lol. That omelette is going to be amazing. I make something similar, and it's one of our faves! LOL, hi Andi! I'm excited to try this one. My hubby makes a different kind that we like but I'm in the mood for something different. Ooh, that sleepin' in omlette looks great! I make a similar casserole (eggs, hash browns, ham) for Christmas every year; it's so nice to make something the day before and just pop it in the oven in the morning! The chili recipe also looks delicious! *also, cheese in the casserole. Can't forget that. Cheese is the MOST IMPORTANT THING. Ever. I've tried a few different egg bake thingies but not sure I've made one with hash browns. That sounds yummy! That's on my to-do list for this evening. I've got my grocery shopping done, and that's the hardest part. Blerg, I have to go grocery shopping today and I'm not looking forward to it, lol. It's one of my least favorite chores. PS I just made your recipe for Crock Pot Chicken Taco Chili! It looked easy enough. It's in the crockpot, sitting in the refrigerator, waiting for tomorrow morning. Thanks for the recipe. My family will be happy to have something to eat for supper. I love the Readathon menu plan! I'm going to have to pin your recipes. I like the sound of the Sleepin in Omelette! I used to do food very willy nilly for the readathon and then I felt yucky all day. There wasn't enough substance and there was WAY too much sugar. Blech! Oh goodness, that all looks delicious! I will have to try that chicken taco chili recipe soon--I think the family has gotten bored with my usual chili recipe (although I don't get why! It's got beer in it, so c'mon people!!). Um, so my readathon food is . . . unplanned. Just like my entire readathon. Uh, I think--ask spouse to pick up some takeout? Or we all go out to dinner and I sit there and read a book at the restaurant? Ha! I have another chili recipe with beer in it that is fantastic as well :D We should swap! Back when I didn't plan my food (or plan MUCH) I ended up eating junk all day which left me feeling crummy. I don't have the tummy of a 20 year old anymore, lol. That caramel sauce recipe is gold -- thank you for sharing it! I might attempt it tonight...! It's so stupid good, Audra! I hope you love it :D Easy peasy too! I am not joining in this year but have fun with it! I love the snacking part. Stuff you can eat with one hand is good and stuff that does not get messy. That whole hand to mouth thing has to be uninterrupted. That's a really good point. You want unimpeded access to your mouth, lol. Sorry to hear that you aren't joining in this time around! Yum! Alas, I'm not doing the readathon; I'll be working all day instead. Oh boo, sorry to hear that! Hopefully you'll be able to join in the spring edition of the readathon! I don't have my menu planned out yet. Probably plenty of popcorn and soup! That omelette looks delicious! 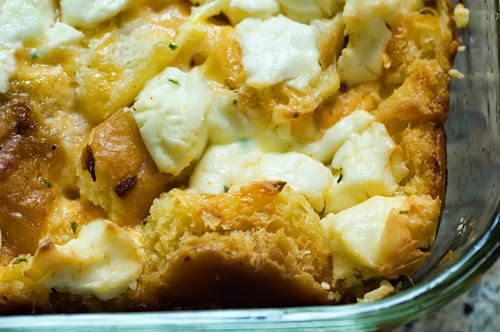 I'm a huge fan of the breakfast casserole and make one with sausage, etc for guests sometimes. Enjoy the readathon! It's in the oven as I type this reply :D I have high hopes for it! Yum! I'm going to throw some baked oatmeal in the oven and some applesauce in the crockpot. Hooray for books and snacks! Do you make your own applesauce, Lindsey? I've never done that. One day? Awesome group of recipes. Yes, it's so important to eat well to keep your eyes and brain sharp for the readathon. Good luck!!!! Thanks :D I learned my lesson during previous readathons. Now I know that I HAVE to have some real food during this long day! I have never done a red fathom but have been intrigued by the idea. I read asuch as time permits so maybe next time? I ought to join in. It's so much fun :) It's just a big gathering of booknerds having a great day, lol. Thanks for your kind words, Tina! Looks like you're all set with good food to fuel your reading. I need to make some of that caramel apple dip! Mmmm, that dip is sinfully good! It's easy to whip up too, which makes it even tastier. Both the Sleepin' In Omelette and the Chicken Taco Chili look good! I've never heard of the omelette so I'll have to check it out. Good luck with the read-a-thon! It was the first time I made that breakfast casserole and I was very pleased with it! Have fun! Cheers from Carole's Chatter! That is so smart! My youngest daughter won't eat it but she's a picky little thing :) I should make a double batch and freeze it. You've inspired me!